An easy recipe for Cream of Asparagus Soup with a secret ingredient for the brightest color and flavor. It’s the perfect way to celebrate when the season’s first green stalks appear. You know that Spring has sprung when the best asparagus starts to pop up in every market. While it’s possible to find asparagus year round these days, in my opinion, the good stuff comes in the Spring. Buy it by the bunch, and let the asparagus recipes begin! Asparagus is a perennial crop that needs to be handpicked and treated carefully. Slow riding tractors pull wagons directly over the crop, with harvesters sitting at the rear of the wagon. When the asparagus appears between their dangling feet, they bend over and pick the stalks, one by one. On a sunny warm day, the freshly picked asparagus is good enough to eat raw. 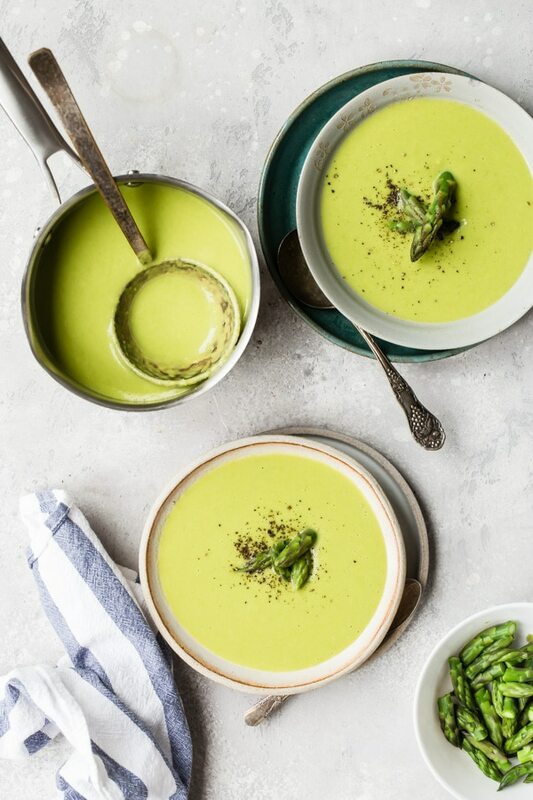 This Cream of Asparagus Soup recipe is the next best thing to being at an asparagus farm. 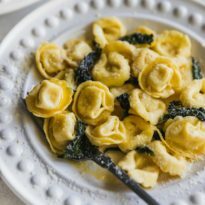 A little bit of cream and some frozen peas add a dreamy, silky texture without weighing it down. Use the best asparagus you can find—I’ll show you how. Making a big pot of Cream of Asparagus Soup to freeze and enjoy all month long? Who could blame you? Click and slide the number next to “servings” on the recipe card below to adjust the ingredients to match how many you’re feeding—the recipe does the math for you, it’s that easy. How do you choose the freshest asparagus? Even though it’s widely available these days due to farming technology, asparagus should be treated delicately and can turn tough and woody quickly. The sugars in asparagus can turn to starch soon after picking, diminishing its bright, grassy flavor and giving the stalks a not-so-tender texture. Thinner isn’t always better. Asparagus is sold in different sizes, but it doesn’t really matter what size you choose, as long as it’s fresh. Any fresh asparagus can be tender and delicious no matter the size. Visual appearance. Look for stalks that are firm, straight, and smooth, with tips that are fresh-looking and have closed buds. Asparagus should be a vibrant green with a slight violet hue at the tips and ends. If the asparagus is not being stored in a shallow pan of water, ice, or on a damp pad, check the ends to see if they’re not completely dried out or flaky. What not to buy: Avoid asparagus that looks wilted, wrinkled, or has darkened black tips that are falling off the stalk. Wrinkles in the stems mean that the asparagus is past its prime. Blanch asparagus tips and set aside (these will be used as a garnish later). Melt butter and sauté remaining chopped asparagus spears and leeks until softened. Add broth and simmer until vegetables are completely soft. Add peas and parmesan. Blend in batches, then stir in lemon juice and half-and-half. Season to taste with s&p. Don’t wash or soak the asparagus before storing it. Trim the ends to make a fresh surface area on the stalks. Then place them upright in an inch or so of cold water. Treat them just like flowers in a vase. A coffee mug or ramekin works well for this! Then store them upright in the refrigerator. Some folks like to wrap the tops with a loose plastic produce bag. This allows them to keep them a little longer, 4 to 5 days. Asparagus cooks best when it is a uniform thickness. However, don’t make the mistake of lopping off precious inches of this vegetable by cutting away too much stem before cooking. Thicker stalks can be peeled down with a vegetable peeler or paring knife to help the asparagus cook evenly. 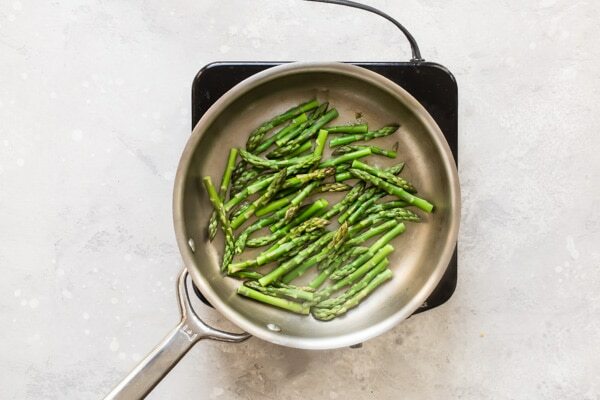 Boiling/Steaming: Not all of us are lucky enough to have a fancy asparagus steamer, so I use a covered shallow skillet with 1/2” of water to cook the asparagus flat in the pan on medium-high heat. It’s sort of a combination boil/steam that works well. Asparagus usually cooks within 5 to 8 minutes. Blanching: If you need asparagus for salads or other cold recipes, boil the stalks and then plunge them into iced water to stop the cooking process. Roasting: Read all about it here! Arrange asparagus in a single layer on a baking sheet. Drizzle with olive oil, garlic, lemon zest, lemon juice, and toss to coat. Season to taste with salt and pepper. Roast in a pre-heated 425 degree oven until the asparagus is browned in spots but is bright green and tender. Grilling: Place asparagus spears on a preheated (medium-high heat) grill sprayed with olive oil. Cook for about 5 to 8 minutes until tender, turning occasionally with tongs. Cream of asparagus soup with milk: This yields a very thin soup that doesn’t have the creaminess or the texture that most people look for. 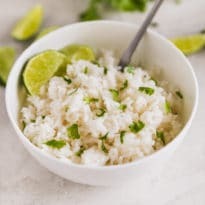 Cream of asparagus soup, vegan: You can certainly switch out the chicken broth for vegetable broth, and use coconut milk in place of cream, but it might affect the taste of the soup you know and love. Please let me know how it goes in the comments below! Cream of Asparagus soup, Barefoot contessa: Ina adds Spanish ham and leeks to her asparagus soup, which are all great additions. Who could argue with ham or bacon of any kind? Asparagus and leek soup: If you have a couple leeks in the veggie drawer, go ahead and us them in this recipe in place of onion. Just use the whites and the very start of the greens, and rinse thoroughly before chopping to get rid of the sand. Cream of Asparagus Soup without cream: Add a diced, peeled potato or two to the broth to cook until tender. Once puréed, the potato gives a creamy texture to the soup without the need for cream. 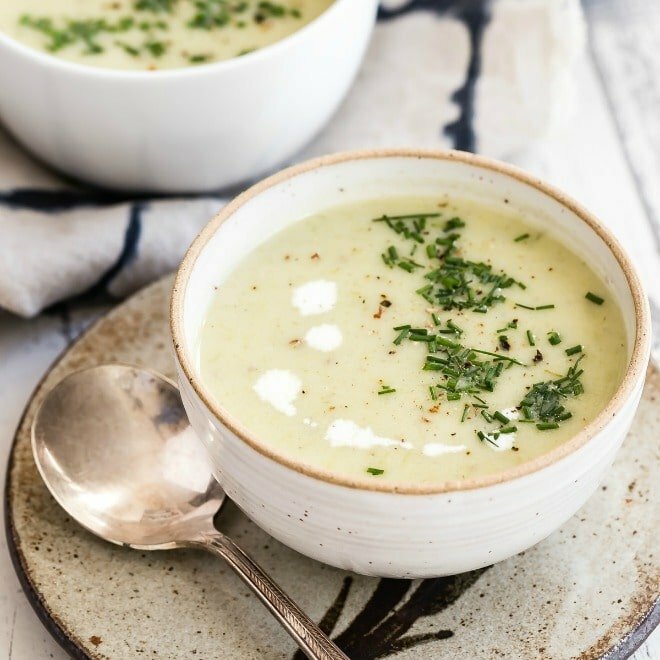 Cream of Asparagus Soup, vitamix: A Vitamix or Blendtec blender is fabulous for puréeing soups, as well as making smoothies, flours, blended drinks, and well, almost everything. 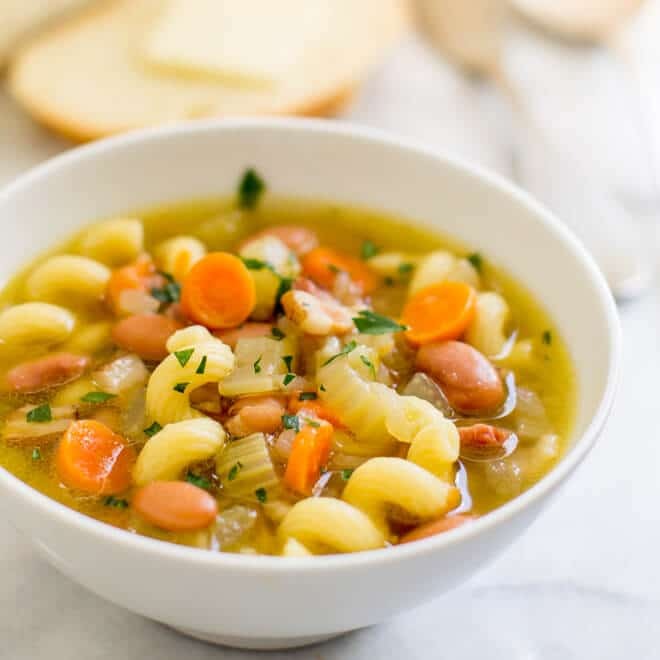 But a standard countertop blender works well for this soup, too. An easy recipe for Cream of Asparagus Soup with a secret ingredient for the brightest color and flavor. It's the perfect way to celebrate when the season’s first green stalks appear. Cut off asparagus tips and set aside. Chop remaining spears into 1/2-inch pieces and set aside. 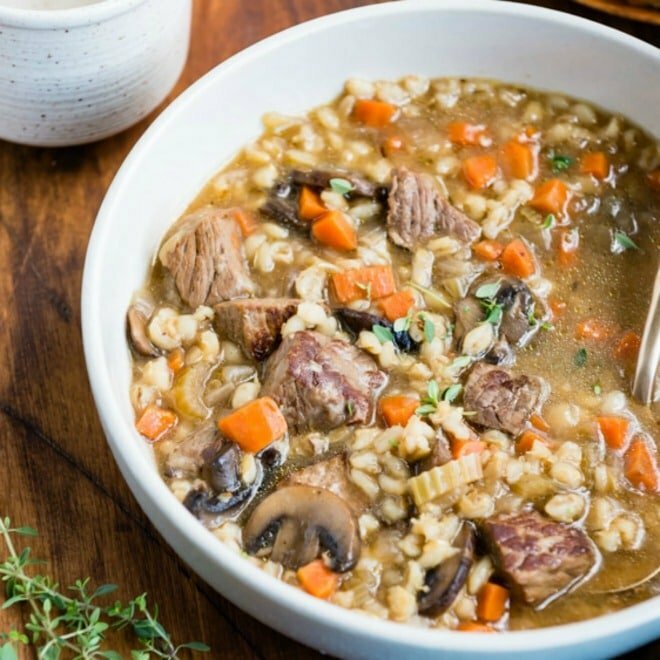 In a small skillet or saucepan, bring 1/2 cup water to boil. Add asparagus tips, cover, and cook until tender, about 2 minutes. Drain well dry on paper towels. In a large saucepan over medium heat, add butter and melt. Stir in chopped asparagus spears and leeks and cook until softened, about 8 to 10 minutes. Add broth and bring to a simmer. Cook until vegetables are completely tender, about 5 minutes. Stir in peas and Parmesan. Working in batches, process soup in blender until smooth, about 2 to 3 minutes. Return soup to saucepan. Over medium-low heat, stir in half-and-half and lemon juice. Season to taste with salt and pepper. Serve and garnish with reserved asparagus tips.